Higher than Niagara and wider than Victoria, the spectacularly vast Iguazu Falls may just be the most impressive waterfall on the planet. The legend behind Iguazu Falls is that a deity fell for a lovely young lass by the name of Naipi, but like all good dramas go, she found love in the arms of another – a mortal by the name of Taroba. The two fled in a canoe down the Iguazu River and in a fit of rage the deity sliced the river in two, plummeting the lovers to their death. Hell hath no fury like a deity scorned. 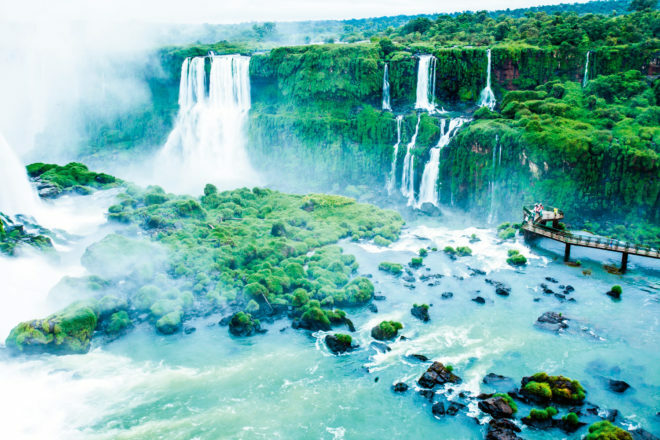 Iguazu – ‘great water’ in the Guarani language – was inscribed on the UNESCO World Heritage List in 1984 and is a truly spectacular sight: with more than 275 individual falls, incredibly it is higher than Niagara and wider than Victoria. Set within subtropical rainforest, the falls sit on the border of Brazil and Argentina, and can be seen from both sides. If you want to get a closer view, the province of Misiones in Argentina is best with boat rides and walking trails through Iguazu National Park; but for a more panoramic view like this one, head to the state of Parana in Brazil. Here, you can also take a helicopter flight to see the majesty from above and avoid the misty spray you’ll no doubt experience from the ground! The best time to visit is during spring (September to November) and autumn (March to May).